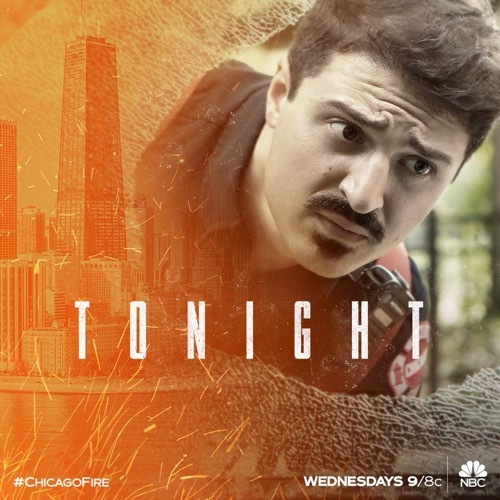 Tonight’s Chicago Fire season 7 episode 4 looks like it is going to be great and you won’t want to miss it. While you’re waiting for our recap make sure to check out all our Chicago Fire recaps, news, spoilers & more, right here! Tonight’s Chicago Fire recap begins now – Refresh Page often to get the most current updates! Chicago Fire begins tonight with Christopher Herrmann (David Eigenberg) getting used to being the new Lieutenant. Stella Kidd (Miranda Rae Mayo) informs Kelly Severide (Taylor Kinney) that her best friend from highschool is in town and she really wants Severide to meet him. Randall “Mouch” McHolland (Christian Stolte) calls Herrmann a “ball buster” as he wants the lines checked every shift; suggesting that no one likes to take orders from someone coming off truck. The alarms sound and everyone is off, it appears to be a “one roomer”, so Kidd and Matt Casey (Jesse Spencer) go into the basement which is fully engulfed in flames. Matt and Stella find a person inside the fire, but when they turn him over, he is severely burned. Outside, they find a pulse and Casey says those aren’t thermal burns, the man’s hands are completely gone. Matt returns inside and inspects the place with Herrmann. It looks like something exploded but it wasn’t gas as all the appliances are still intact. According to the pattern it looks like he was holding whatever exploded, possibly a homemade pipe bomb; Matt realizes it was a grenade and they call the bomb squad ordering no one to go inside as there could be more inside. Mickey Barnes (Jerry Kernion) is told to rehook up the lines and fill up before they return to 51, in case they get a call on the way back to the firehouse. Mouch greets the candidate, saying he missed him at the picnic; he meets his Dalmatian named Tuesday. Mouch learns that the candidate has quit the CFD and that is why he didn’t go to the picnic as he doesn’t want to float around to find the right fit. He thanks him for all the advice and gives him a gift his uncle gave him when he joined the department and he just doesn’t want the reminder. Herrmann asks Chief Wallace Boden (Eamonn Walker) where Jerry Gorsch (Steve Boyer) is, wondering if he is backing off. Boden asks how things are going for him as Lieutenant, he says things are good so far. Boden reminds him that they ruffled a few feathers and need this transition to be smooth. Tyler arrives at the firehouse and is greeted by Severide who brings him to see Stella, who runs into his arms; then quickly introduces him to everyone to her best friend. He shows them photos of them growing up throughout the years. Kelly watches them from the background as Tyler reveals how Stella crushed his heart back in the day. A call comes in for the ambulance and Sylvie Brett (Kara Killmer) and Emily Foster (Annie Ilonzeh) go to a gym where a young girl, Erica Curtis fell from a bar. Her mother says she has to compete in two days and has to be okay. They take a look and her bone is completely out of place and black. At Chicago Med, Emily says their patient is 12 years old looks like she is using performance enhancing drugs. The doctor refuses to test her for PEDs when she came in with a broken clavical, based on the hunch of a paramedic. Herrmann doesn’t want Barnes to like him, but he has to do what he says, as they have to be a team; before he leaves he invites him to come to Molly’s and offers to give him 10% off all his drinks. Meanwhile, in the kitchen Joe Cruz (Joe Minoso) serves dinner, while Tyler continues to talk about how fine Stella looks doing her job. He has to leave for work but invites her out to dinner one night this week; Stella wants him to get to know Kelly and he says they will work something out. Joe wants to know what Severide thinks of Tyler and he tells Cruz to go clean out the driver’s side of the rig. The ambulance returns and Emily says the doctor at Med was a prick, saying the doctor just doesn’t want her to be right. Emily feels the mother wants her daughter to win so badly that she will give her the drugs to do it. The alarms sound as another explosion happens in a park, Matt and Stella find a huge hole in the ground and a statue blown right out off the stand. Casey realizes its another grenade as Brian “Otis” Zvonecek (Yuri Sardarov) finds a vehicle with a hole through the side window. Boden is brought up to date on the two grenades, saying this isn’t a coincidence. CPD Kevin Atwater (LaRoyce Hawkins) and Kim Burgess (Marina Squerciati) are unable to question the man they found in the fire, as he is still unconscious and the only information Matt was able to obtain is the suspects are all Caucasian males ages 15 or 16. Kim and Kevin are going to review cameras and get the story out to the media to see what the tip line produces. At Chicago Med, Emily confronts Mrs. Curtis who tells her that Erica is in surgery for another few hours as they are putting a metal plate in her clavicle. Emily wants to know about the PEDs and if she knows about the devastating effects it would have on her 12-yr-old girl. When the doctor returns, Sylvie pulls her away reminding Foster she is no longer a doctor and once they hand over the patient, they need to step aside. Stella shares how happy she was that Kelly got to meet Tyler. She tells him that Tyler invited them to his lakehouse; but Severide can’t hid is disdain. He says that Tyler is in love with her, and she insists she is only friends. Kelly tells her to go if she wants, but he is right about this. Sylvie says she is restocking the ambulance but as she sees Emily researching PEDs, Emily says she is right about this and just wants to help this little girl. Herrmann sits with Boden, asking for some advice, feeling he is about to lose it on Barnes. Boden tells him to forget what the leadership books say and to go with his gut and go do what he has to do. An elderly woman comes to the firehouse, calling Casey over, holding a box saying she didn’t no where else to go nor what to do with these. Casey looks inside the box and sees several grenades inside. Severide approaches and he tells Cruz to clear everyone off the floor, Severide puts them on the table as Boden and Casey take the woman into the office while they wait for the CPD. The woman has no idea where her deceased husband got the grenades, she says she never would have sold them at the garage sale if she knew they were real and she sold three of them. Boden and Casey updates the firehouse that there is still a grenade out there in the hands of an 11 or 12 year old boy and they will be working with CPD to find it. They are to canvas the streets, schools and playgrounds. Stella tells Severide she is not going to go to the lake house, as she’d rather be with him instead. As Herrmann hands out the flyers to his team, Barnes tells every to stay serious as their Lieutenant doesn’t have a sense of humor. Herrmann tells him that since being a firefighter is such a big joke to him, he doesn’t have to worry about coming out with them. Barnes says he was just yanking his chain but Herrmann informs him he has already filled out the paper and he needed them to work together like a well oiled machine and he is officially transferring him out of 51; hands him his pink slip and takes the flyers back, ordering him to clean out his locker and to be gone by the time he gets back. While CFD is out, Emily gets a call from Amanda, Erica’s mother. Matt is determined to find the boy, telling Otis to go to the next block until they find him. A young boy comes to Matt saying Kyle Buchanan has it and they are filming a movie in his back yard, telling him where they are. Boden calls bomb squad and CPD to meet them there. Matt arrives just in time as Kyle pulls the pin and yells for Kyle to freeze. Otis gets the other kids out of the area, as Kyle panics and releases the handle; Matt thinks quick and throws it in the pond and hits the ground, it explodes but no one is hurt. Emily and Sylvie arrive at the C.I.T.Y. CLUB where Erica trains, before they go in Sylvie apologizes for not having her back, saying her old partner was her best friend and she should have had her back from the start. Emily promises she has Sylvie’s back. Inside, Sylvie and Emily interrogate Erica’s trainer, who tries to act surprised; he says that he gave her B12 injections every day as that is perfectly legal. He order them to get out after he realizes they called the CPD. He says its outrageous and hasn’t done anything wrong. At Chicago Med, Amanda is very upset that Erica was being drugged this whole time by her coach. She thanks Sylvie but she says it is because of Emily that they ran the drug test. Inside the room, Erica says she needed the injections to make her stronger to win, but Emily tells her she used to think that winning was everything too but thinking like that is a fast train into a brick wall or a hospital bed. She tells Erica she has talent and that can lift her up and have fun and she can go far with that. Herrmann realizes now that they are a man down, Gorsch will probably have a relative to recommend. Mouch has a suggestion. Tyler comes back to the firehouse to check on Stella before he heads to the party. Severide says that Stella changed her mind but Tyler feels someone might have changed her mind for her. Tyler warns him that he may be leaving Chicago, but he will never be out of her life! Severide is trying to enjoy his night with Stella, but she doesn’t like that he isn’t offering an opinion at all about their date. Tyler messages her, saying she should be there with them. She laughs at the photo as she stares at everyone at the bar. Herrmann sits with Mouch and the Candidate, and says he trusts Mouch’s opinion as much as he trusts his own. Mouch tells Ritter, “This isn’t charity” and he is looking out for his friend who needs someone he can count on. Ritter smiles and agrees to join Firehouse 51. Ritter wants to know why Mouch is doing this for him; Mouch says because he got back up and that is the hardest part and he should take that from someone who has been there. Ritter promises to make him proud. Mouch welcomes him to 51!